Narayanpura is a small village near Yellahanka, Bangalore. 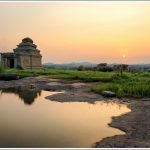 It is close to NH-44 which is the highway leading to KIAL (Bangalore Airport). Almost every other household makes clay pots and products. 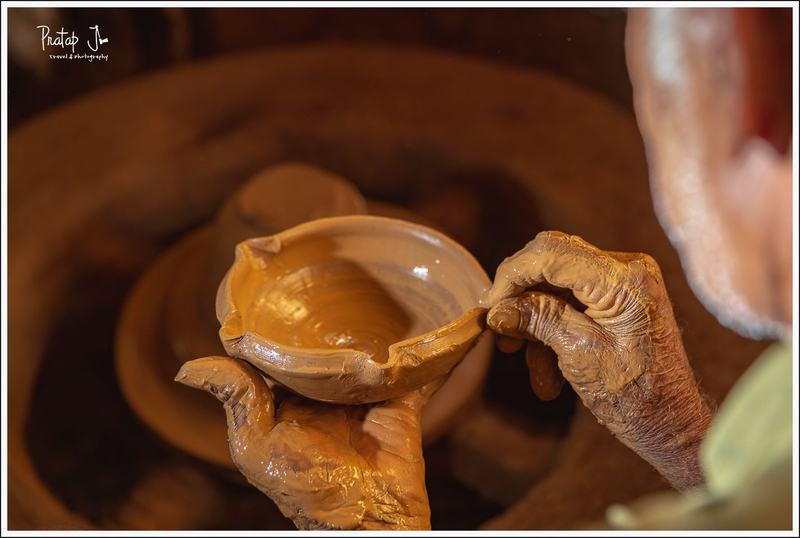 Here, you will find potters shaping clay by hand on traditional wooden wheels. In many parts of the world, these wooden wheels have become extinct and are replaced with electric ones. 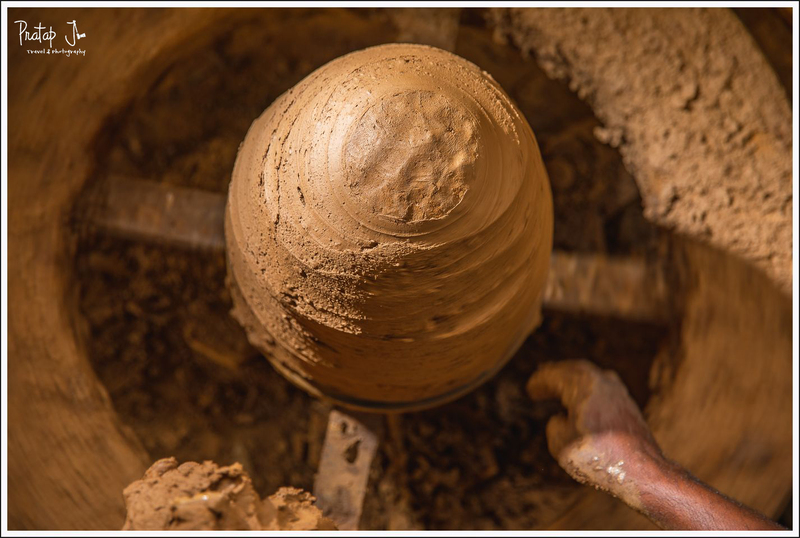 This photo feature documents traditional clay pot making. 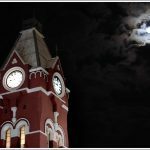 These photos were taken on a half a day visit to Naryanpura. While we visited, we also found households making Ganesha Idols. 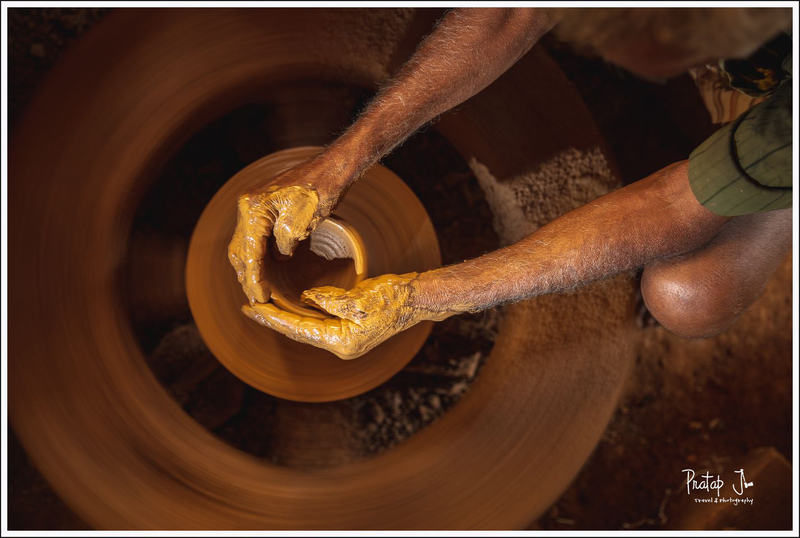 The process starts with clay which the artisans obtain from the riverbed. 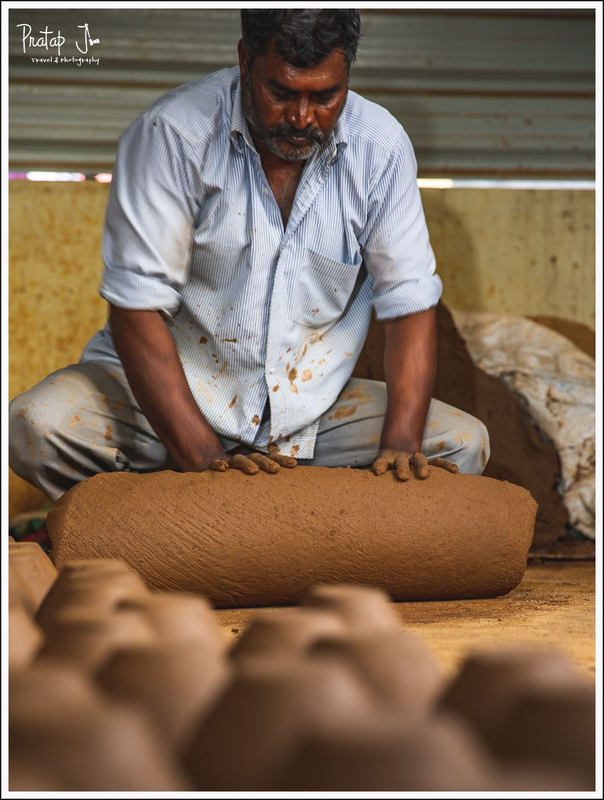 We were told that a tractor-load of clay costs Rs 3000/- The clay is kneaded well, which is quite visibly an effort. The clay is then placed on top of the wheel. 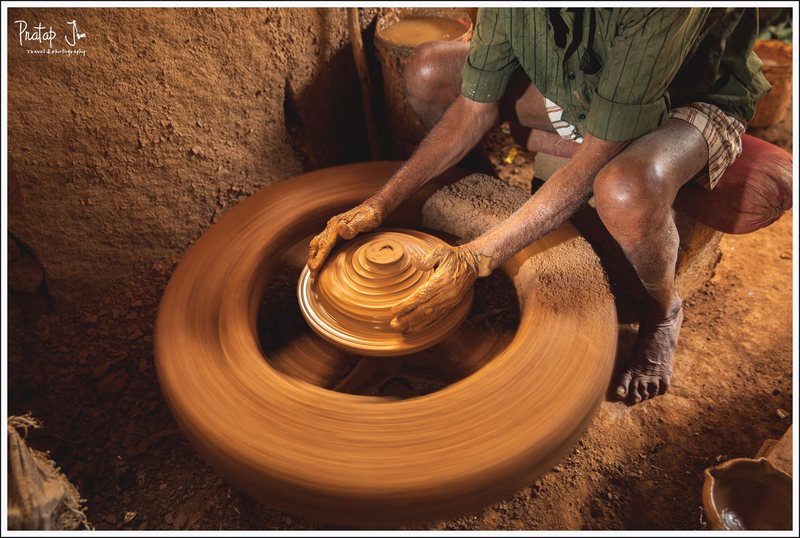 The potter uses a stick to make the wheel rotate fast. 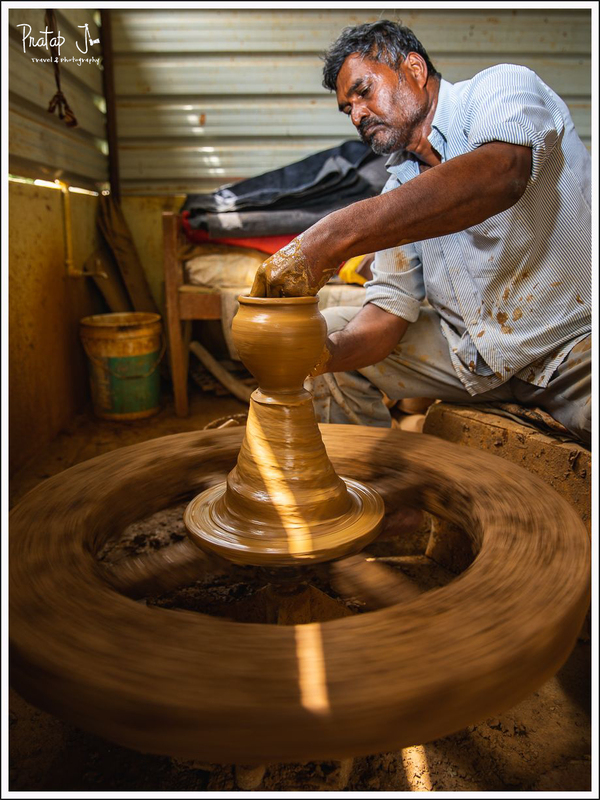 He has time till the wheel slows down to make as many pots as possible. 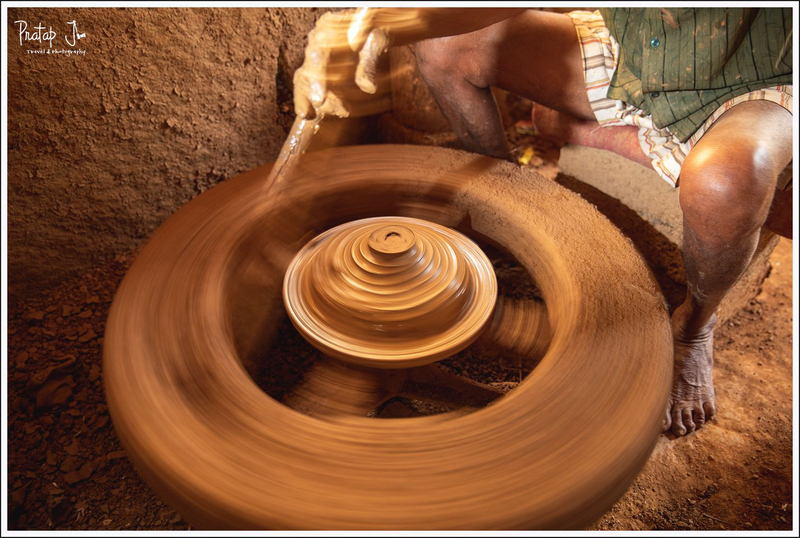 After the wheel starts spinning, the potter brings in his experience and skill to shape the clay into a beautiful pot. 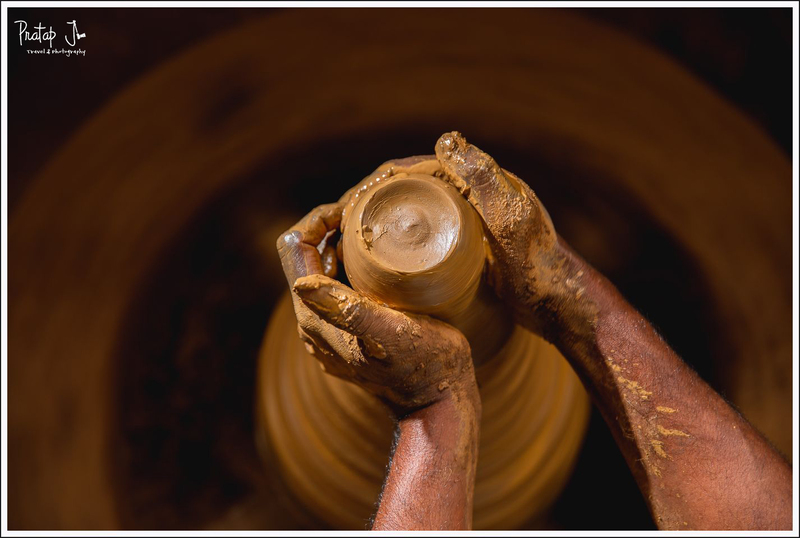 By simply cupping his hands, the potter creates pots of different sizes. 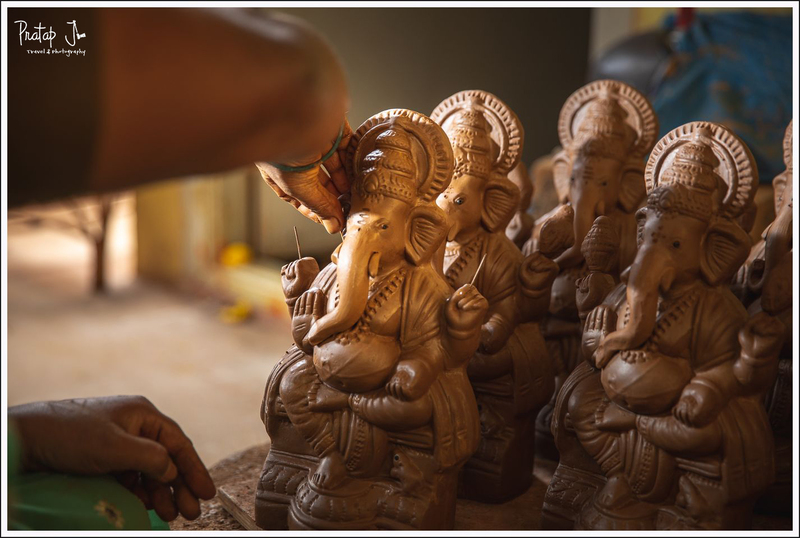 It is mesmerising to watch the transformation of clay into something simple, yet beautiful. The potter can bring contours to the pot using simple tools. 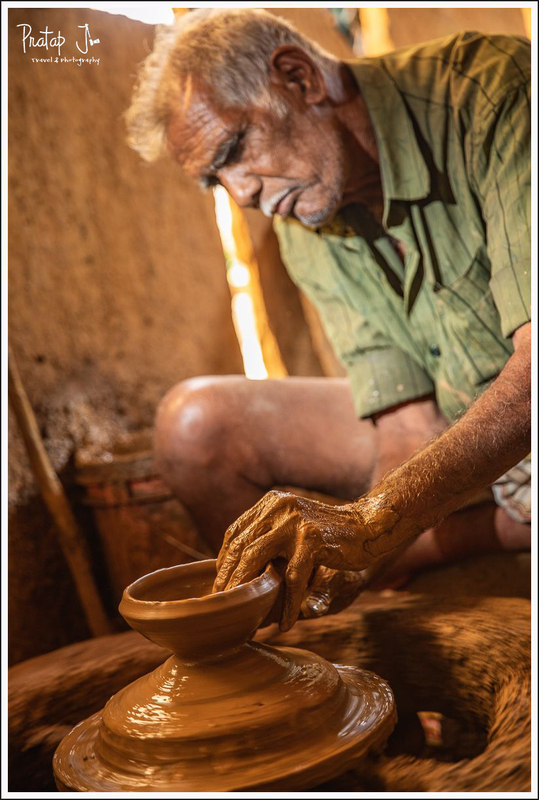 This potter used his fingers to shape the shallow pot into a diya. 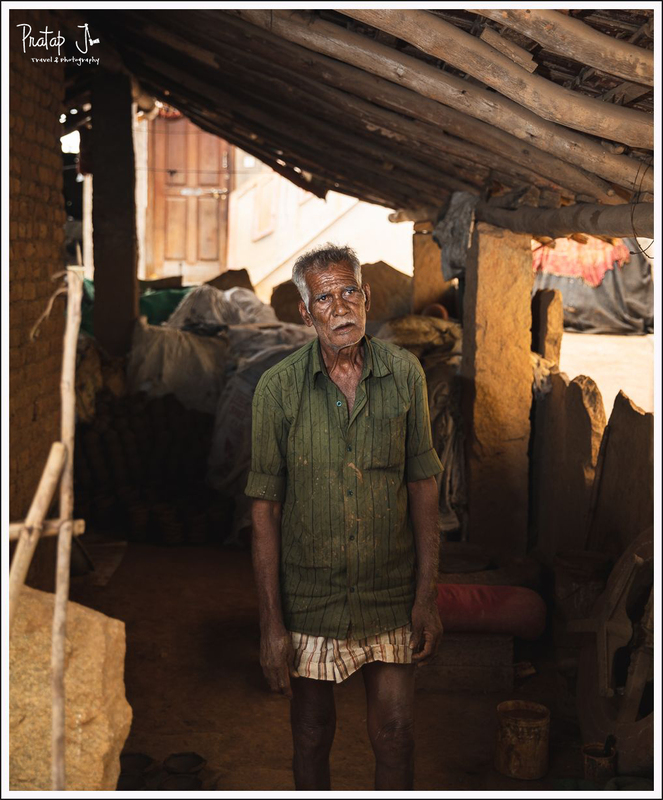 Although aged, the potter was expertly making diyas without a break. The countdown starts the moment the clay is wet, and the wheel starts spinning. Working with hands continuously is no easy task! After finishing his work, the potter posed for a photo. 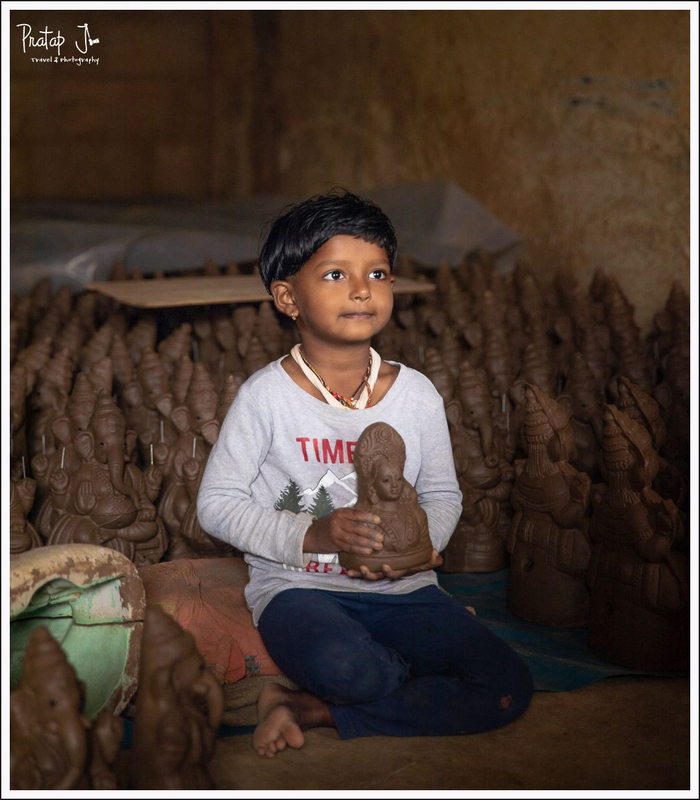 He was visibly tired after making a lot of clay diyas! 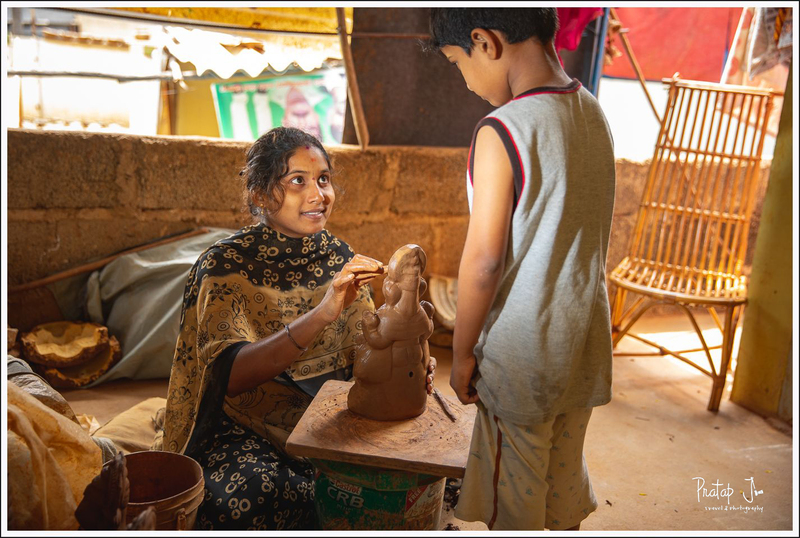 At Narayanpura, we also saw households involved in making Ganesha idols for the upcoming festival. 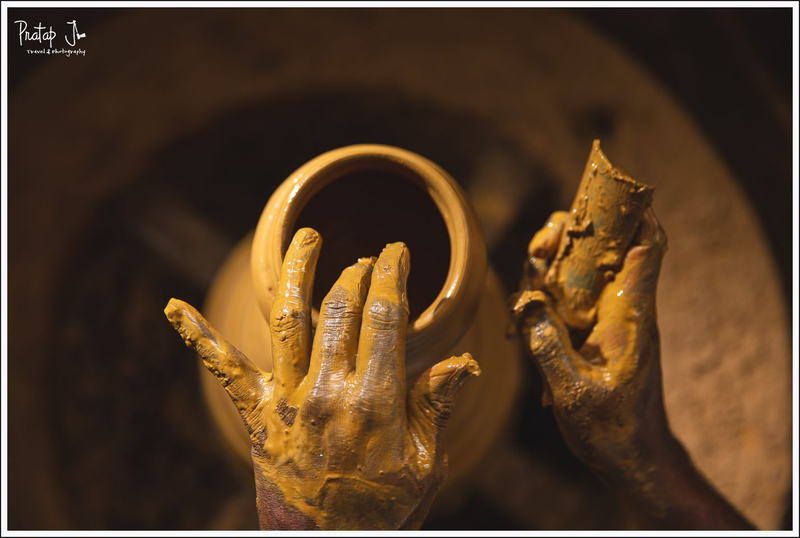 The clay is first put into a mould and later shaped by hand. 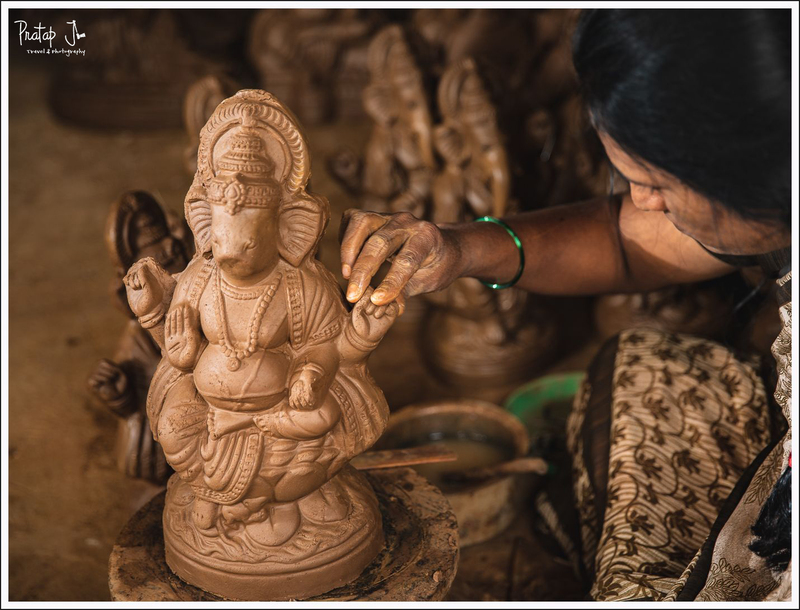 The process of shaping the Ganesha idols was mostly done by women. 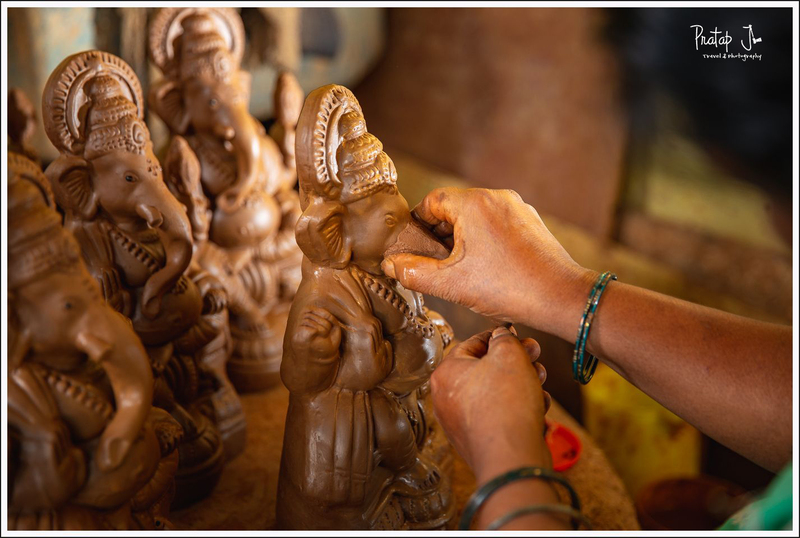 Making a clay Ganesha idol involves delicate procedures such as attaching the trunk and placing eyeballs made from beads. 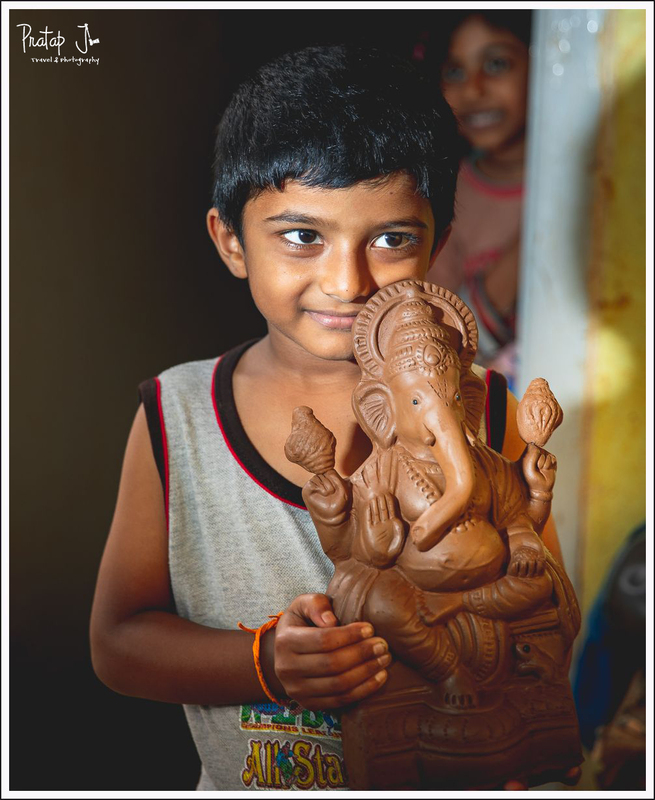 Everyone, old and young, was involved in making the Ganesha idols. With only a month to go, there were large orders to fulfil. The kids happily posed for us. While it was nice to see only clay Ganesha idols, we did find a stockpile of garishly painted Ganeshas. The paint on these idols definitely did not seem environment friendly. 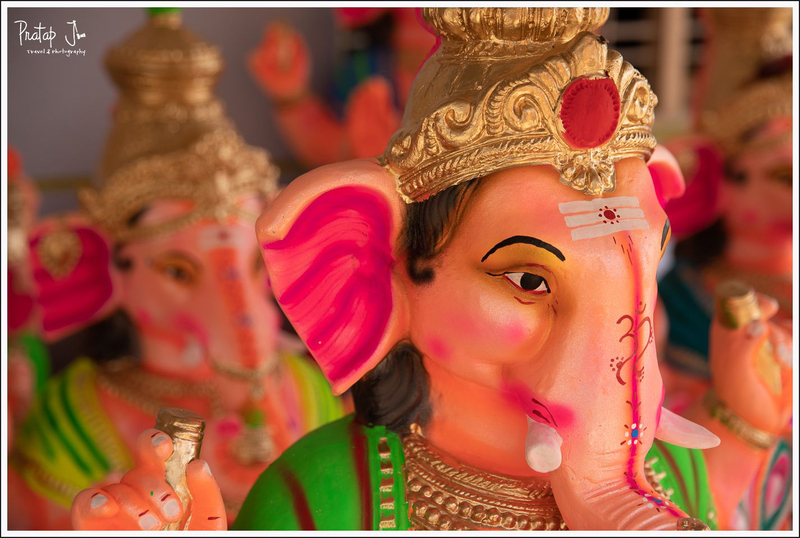 On the eve of Ganesha Chathuri, please take a vow to buy only environment friendly Ganesha idols. If you plan to visit Naryanpura, you can buy these idols directly from the potters. This will benefit them, so it is a good thing to do. If you intend to take photos of the potters, please do not go in large groups. Most of them work inside their houses and there may not be much space for a large group of people.